Baseball Cards by the Team Sets are a great fun way for everyone in the family to collect baseball cards of their favorite players and team. Buying baseball cards by the team set is an easy and fast way to build a sports cards collection of your favorite team without the time and trouble of buying them by the single baseball card or trying to get lucky and pull them from packs. It's only natural that baseball fans would want to collect sports cards of their favorite team and there is no better way than collecting teams sets to do that. We are sure to carry your personal favorite team because we carry them all. From the Angles, Yankees and Giants to the Braves, Cardinals and Pirates and every Major League Baseball team in between, we have them all. Look for Great Super Star baseball cards like Mike Trout, Albert Pujols, Shohei Ohtani, Josh Hamilton, Vladimir Guerrero, Bengie Molina, Jarrod Washburn, Bartolo Colon, Steve Finley, Darin Erstad, Jim Edmonds, Troy Glaus, Tim Salmon, Nolan Ryan, Dante Bichette, Bert Blyleven, Reggie Jackson, Rod Carew, Tommy John, Fred Lynn, Bob Boone and Jim Abbott in Anaheim Angels Baseball Card Team Sets. Look for Great Super Star baseball cards like Paul Goldschmidt, Patrick Corbin, Justin Upton, Wade Miley, Trevor Bauer, Johnny Estrada, Shawn Green, Luis Gonzalez, Orlando Hernandez, Troy Glaus, Shawn Estes, Randy Johnson, Mark Grace, Curt Schilling, Matt Williams, Travis Lee and Luis Gonzalez in Arizona Diamondbacks baseball card team sets. Look for Great Super Star Players baseball cards like Ronald Acuna Jr, Freddie Freeman, Dansby Swanson, Jason Heyward, Brian McCann, Freddie Freeman, Tim Hudson, Dan Uggla, Grag Maddux, Andrew Jones, Tom Glavine, Chipper Jones, Dale Murphy, Brett Butler, Phil Niekro and John Smoltz in Atlanta Braves baseball card team sets. Look for Great Super Star baseball cards like Cal Ripken Jr, Manny Machado, Dylan Bundy, Nick Markakis, Adam Jones, Miguel Tejada, Javy Lopez, Mike Mussina, Jim Palmer, Eddie Murray, Dennis Martinez, David Segui, Curt Schilling and Greg Olson in Baltimore Orioles baseball card team sets. Look for Great Super Star Players baseball cards like Mookie Betts, Andrew Benintendi, Rafael Devers, Xander Bogaerts, Dustin Pedroia, Will Middlebrooks, Jacoby Ellsbury, David Ortiz, Nomar Garciaparra, Pedro Martinez, Manny Ramirez, Dante Bichette, Wade Boggs, Roger Clemens, Mike Greenwell, Carl Yastrzemski, Jim Rice, Dwight Evans, and Dennis Eckersley in Boston Red Sox baseball card team sets. Look for Great Super Star Players baseball cards of Kris Bryant, Addison Russell, Kyle Schwarber, Javier Baez,, Anthony Rizzo, Starlin Castro, Darwin Barney, Sammy Sosa, Mark Prior, Kerry Wood, Greg Maddux, Andre Dawson, Ryne Sandberg, Fred McGriff, Mark Grace, Moises Alou, Lee Smith, Mel Hall, Fergie Jenkins, Ron Cey, Bill Buckner and Larry Bowa in Chicago Cubs baseball card team sets. Look for Great Super Star baseball cards like Nick Swisher, Jim Thome, Paul Konerko, Jermaine Dye, Orlando Cabrera, Frank Thomas, Magglio Ordonez, David Wells, Ray Durham, Sammy Sosa, Kenny Lofton, Harold Baines, Carlton Fisk, Jerry Koosman, and Greg Luzinski in Chicago White Sox Baseball Card Team Sets. Look for Great Super Star baseball cards like Ken Griffey Jr, Barry Larkin, Pete Rose, Johnny Bench, Dave Concepcion, Adam Dunn, Aaron Boone, Austin Kearns and Sean Casey in Cincinnati Reds Baseball Card Team Sets. Look for Great Super Star baseball cards like Jim Thome, C.C. Sabathia, Roberto Alomar, Kenny Lofton, Manny Ramirez, Omar Vizquel, Brian Giles, Bert Blyleven, Julio Franco, Rick Sutcliffe, Juan Gonzalez, Jody Gerut, and Coco Crisp in Cleveland Indians Baseball Card Team Sets. Look for Great Super Star baseball cards like Larry Walker, Todd Helton, Luis Gonzalez, Zach Day, Todd Zeile, Dante Bichette, Darryl Kile and Denny Neagle in Colorado Rockies Baseball Card Team Sets. Look for Great baseball cards of players like Miguel Cabrera, Ivan Rodriguez, Dmitri Young, Magglio Ordonez, Justin Verlander, Carlos Guillen and Curtis Granderson, Lou Whitaker, Alan Trammell, Fred Lynn, Jack Morris, and Jeremy Bonderman in Detroit Tigers Baseball Card Team Sets. Look for Great baseball cards of players like Giancarlo Stanton, Hanley Ramirez, Dan Uggla, Cameron Maybin, Miguel Cabrera, Dontrelle Willis, Hanley Ramirez, Ivan Rodriguez, Jason Stokes, Cliff Floyd, Luis Castillo, Josh Beckett and Derrek Lee in Florida Marlins Baseball Card Team Sets. Look for Great Super Star baseball cards of players like Carlos Correa, Alex Bregman, George Springer, Jose Altuve, Hunter Pence, Jeff Bagwell, Lance Berkman, Craig Biggio, Nolan Ryan, Roger Clemens, Joe Niekro, Ray Knight, Phil Garner, Bill Doran and Ken Caminiti in Houston Astros Baseball Card Team Sets. Look for Great Super Star baseball cards of players like George Brett, Eric Hosmer, Mike Moustakas, Salvador Perez, Alex Gordon, Zack Greinke, Luke Hochevar, Bo Jackson, Kevin Appier, Carlos Beltran, Gaylord Perry, Frank White, Bret Saberhagen, and Jimmy Gobble in Kansas City Royals Baseball Card Team Sets. Look for Great Super Star baseball cards of players like Clayton Kershaw, Cody Bellinger, Corey Seager, Matt Kemp, Adrian Gonzalez, Hanley Ramirez, Andre Ethier, Russell Martin, Chad Billingsley, Eric Gagne, Rafael Furcal, Bill Mueller, J.D. Drew, Cesar Izturis, Kevin Brown, Shawn Green, Eric Karros, Hideo Nomo, Gary Sheffield and Kazuhisa Ishii in the Los Angeles Dodgers Baseball Card Team Sets. Look for Great Super Star baseball cards of players like Ryan Braun, Robin Yount, Paul Molitor, Rickie Weeks, Prince Fielder, Ben Sheets, Geoff Jenkins, Russell Branyan, Gary Sheffield, Jeromy Burnitz, Don Sutton, and Rollie Fingers in Milwaukee Brewers Baseball Card Team Sets. 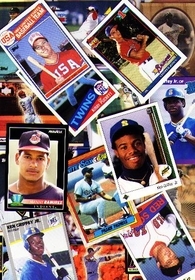 Look for Great Super Star baseball cards of players like Byron Buxton, Brian Dozier, Joe Mauer, Max Kepler, Kirby Puckett, Torii Hunter, Brad Radke, Shannon Stewart, Johan Santana, Lew Ford, Kent Hrbek, Frank Viola and Gary Gaetti and Joe Mauer in Minnesota Twins Baseball Card Team Sets. Look for Great Super Star baseball cards like Vladimir Guerrero, Fernando Tatis, Dennis Martinez, Marquis Grissom, Larry Walker, Delino DeShields, Jason Bay, Gary Carter, Tim Raines, Andre Dawson, Al Oliver, and Tim Wallach in Montreal Expos Baseball Card Team Sets. Look for baseball cards of great players like Noah Syndergaard, Jacob deGrom, Michael Conforto, David Wright, Johan Santana, Ike Davis, Mike Piazza, Mo Vaughn, Roberto Alomar, Robin Ventura, Gary Carter, Keith Hernandez, Nolan Ryan, Tom Seaver, Rusty Staub, Mookie Wilson, Dave Kingman and David Cone in New York Mets Baseball Card Team Sets. Look for baseball cards of Great Players like Aaron Judge, Masahiro Tanaka, Luis Severino, Gary Sanchez, Greg Bird, Alex Rodriguez, Derek Jeter, Hideki Matsui, Mariano Rivera, Jorge Posada, Robinson Cano, Bobby Abreu, Johnny Danon, Paul O'Neill, Roger Clemens, Alfonso Soriano, Bernie Williams, Don Mattingly, Deion Sanders, Dave Winfield and Jason Giambi in New York Yankees Baseball Card Team Sets. Look for baseball cards of great players like Matt Holliday, Jason Giambi, Eric Chavez, Mark McGwire, Jose Canseco, Rickey Henderson, Barry Zito, Adam Piatt, and David Justice in the Oakland Athletics Baseball Card Team Sets. Look for baseball cards of Great Players like Maikel Franco, Aaron Nola, Mike Schmidt, Pete Rose, Steve Carlton, Pat Burrell, Scott Rolen, John Kruk, Len Dykstra and Darren Daulton in Philadelphia Phillies Baseball Card Team Sets. Look for Great Super Star baseball cards of players like Starling Marte, Gregory Polanco, Josh Bell, Andrew McCutchen, Pedro Alvarez, Jason Bay, Brian Giles, Jason Kendall, Kris Benson, Barry Bonds, Bobby Bonilla, Andy Van Slyke, Dave Parker and Kent Tekulve in Pittsburgh Pirates Baseball Card Team Sets. Look for Great Super Star baseball cards of players like Yadier Molina, Randal Grichuk, Albert Pujols, Jim Edmonds, Mark McGwire, J.D. Drew, Ozzie Smith, So Taguchi, Willie McGee, Tom Herr and Andy Van Slyke in St. Louis Cardinals Baseball Card Team Sets. Look for Great Super Star baseball cards of players like Wil Myers, Hunter Renfroe, Jake Peavy, Brian Giles, Adrian Gonzalez, Tony Gwynn, Rickey Henderson, Ryan Klesko, Kevin McReynolds, Steve Garvey and Dave Dravecky in San Diego Padres Baseball Card Team Sets. Look for Great Super Star baseball cards of players like Buster Posey, Madison Bumgarner, Brandon Crawford, Aaron Rowand, Tim Lincecum, Bengie Molina, Barry Bonds, J.T. Snow, Jeff Kent, Benito Santiago, Matt Williams, Chili Davis, Darrell Evans, Jack Clark and Will Clark in San Francisco Giants Baseball Card Team Sets. Look for Great Super Star baseball cards of players like Ichiro Suzuki, Adrian Beltre, Felix Hernandez, Kenji Johjima, Randy Johnson, Ken Griffey Jr, Alex Rodriguez, Edgar Martinez, John Olerud, and Ruben Sierra in Seattle Mariners Baseball Card Team Sets. Look for Great Super Star baseball cards of players like Evan Longoria, Carl Crawford, B.J. Upton, Pat Burrell, Scott Kazmir, David Price, Ben Grieve, Greg Vaughn, and Troy O'Leary in Tampa Bay Rays Baseball Card Team Sets. Look for Great Super Star baseball cards of players like Nomar Mazara, Joey Gallo, Shin-Soo Choo, Adrian Beltre, Josh Hamilton, Yu Darvish, David Murphy, Hank Blalock, Michael Young, Nolan Ryan, Alfonso Soriano, Juan Gonzalez, Alex Rodriguez, Rafael Palmeiro and Ivan Rodriguez in Texas Rangers Baseball Card Team Sets. Look for super star baseball cards of players like Troy Tulowitzki, Marcus Stroman, Josh Donaldson, Russell Martin, Raul Mondesi David Wells, Fred McGriff, and Alex Gonzalez in Toronto Blue Jays Baseball Card Team Sets. Look for Great Super Star baseball cards of players like Bryce Harper, Trea Turner, Max Scherzer, Stephen Strasburg, Ryan Zimmerman, Austin Kearns, Lastings Milledge, Junior Spivey, Preston Wilson, Alfonso Soriano, Liv�n Hern�ndez, Vinny Castilla, Nick Johnson, Jos� Vidro, Brad Wilkerson, and Endy Ch�vez in Washington Nationals Baseball Card Team Sets. Look for super star cards from all teams in these great small sets including All Stars.